I live here, in the none zone. However, there is a curious thing that happens as soon as the sun comes out. People start going up into the mountains climbing as high and as far as their bodies will let them. Going on a trail, you will never be alone. There are always people traveling with you. 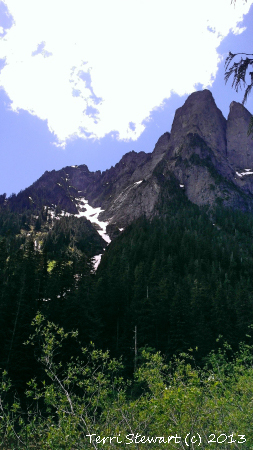 I thought, today as I hiked, “This is Pacific Northwest church!” Meaning people are seeking a mystical experience by going up as high as they can and as deep into nature, away from the cities, as they can. Long ago, I mean a really long time ago, about 3,000 BCE or so, the ancient semitic worldview was quite different from our worldview. The world was flat, the mountains held up the dome of heaven, the concept was that the higher you went up the mountain, the closer you got to the divine. A concrete example of this is the many times that Moses went up the mountain in Hebrew scripture. He goes up to speak to God and comes back down to lead the people. I have included a picture depicting the ancient semitic worldview. 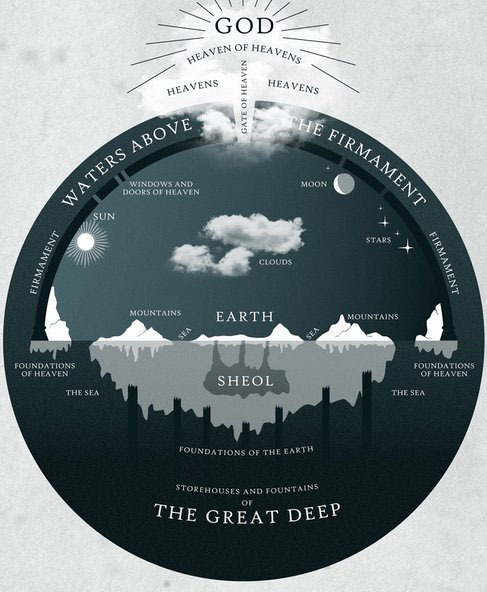 The picture doesn’t quite get across the idea that the highest mountain top was considered to be directly underneath the throne of heaven. So if you could get to the tippy top, you could be the closest to the divine. In many ways, the folks here, although not religious, are seeking an experience of transformation that happens at the top of the mountain. Seeing the beauty in sparkling water or the dappled shadows of leaves on the trail. Hearing delighted laughter as a child discovers the lake around the corner or standing still while a bird communes with you. Each act of curiosity, amazement, and even perseverance is an act of transformation. And transformation expands your heart, maybe even up to three times (odd reference to the Grinch here-“and his heart grew three times that day”)! Hiking, for me, feeds into my spiritual practice of contemplative walks. Coincidentally, it feeds into the ancient pattern of going to the top of the mountain to experience the divine. It is not only the ancient semitic people that did this! I am reminded particularly of the Blackfeet from Heart Butte, Montana. Their most sacred spot (no photos) is at the top of a mountain. There is a tree and people carry their prayers and offerings to that tree and put them there. It feels sacred. It is the holder of dreams and hopes. Hopefully, that is what our spiritual practices lead us to! A place inside our bodies that can hold dreams and hopes–and great sorrow. Mountains are both physical and metaphorical. Not all of us can climb up a mountain (I am not going to go all the way to the top of Mt. Rainier!). But we all face challenges. Our challenges can either be transformational or they can get us stuck in the mud. So all of this is really a wind-up to get to the questions! Can you go up it? Do you need to go around it? Is there a creative, third way to approach the mountain? What spiritual practices will strengthen you for the journey? We’re gonna go through it! What do you have to go through? And how will you go through it? TERRI STEWART is Into the Bardo’s Sunday chaplain, senior content editor, and site co-administrator. She comes from an eclectic background and considers herself to be grounded in contemplation and justice. She is the Director and Founder of the Youth Chaplaincy Coalition that serves youth affected by the justice system. 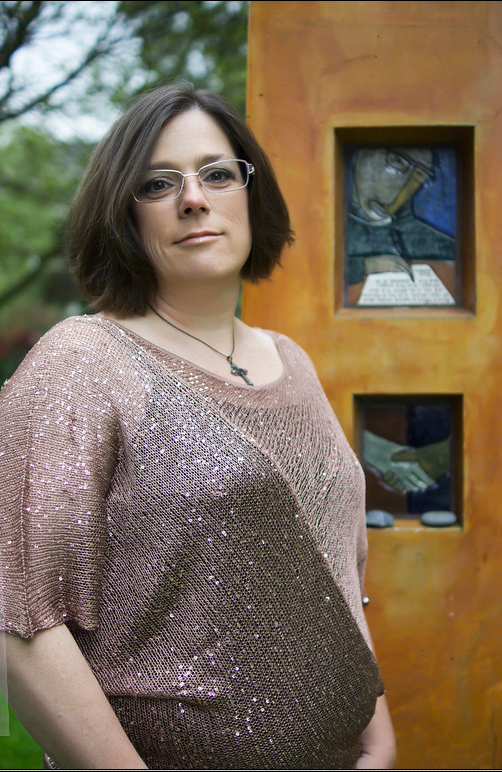 As a graduate of Seattle University’s School of Theology and Ministry, she earned her Master’s of Divinity and a Post-Master’s Certificate in Spiritual Direction with honors and is a rare United Methodist student in the Jesuit Honor Society, Alpha Sigma Nu. She is a provisional elder in the United Methodist Church and a contributing author to the Abingdon Worship Annual.